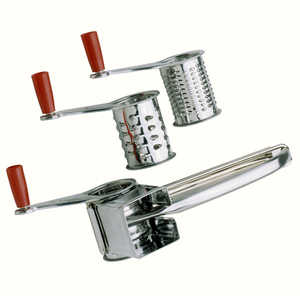 A drum grater is the quickest way to grate cheese, nuts, vegetables and more. Professional gauge stainless steel construction. Comes with three stainless steel drums; on for fine grating, one for coarse grating and one for slicing. Grates in a hurry, without skinned knuckles. For right and left hand use.